As an archaeologist, I believe we can access some of the day-to-day, face-to-face interactions of past people through the material culture they left behind. Ceramics are one of the most commonly found material culture types around the world and throughout time. There are many steps that go into ceramic making. Some of these include: gathering and refining clay; adding materials to that clay to make it more workable; forming that clay into a pot; then decorating, drying and firing that pot. Some of the steps in ceramic making, like exterior decoration, have been studied extensively by archaeologists trying to understand cultural connections in the past. Other steps, such as how people actually formed clay into pots, are more difficult to access. However, ethnographic evidence tells us that formation methods are often learned, passed on, and maintained across generations, even as more visible decorative techniques change over time. So how can we access how people were forming pots out of clay? 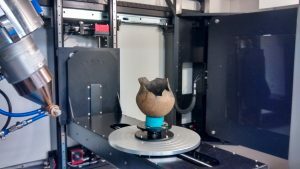 My research explores the ceramic analysis potential of innovative micro CT technology available at the Sustainable Archaeology: Western, located next door to MOA. 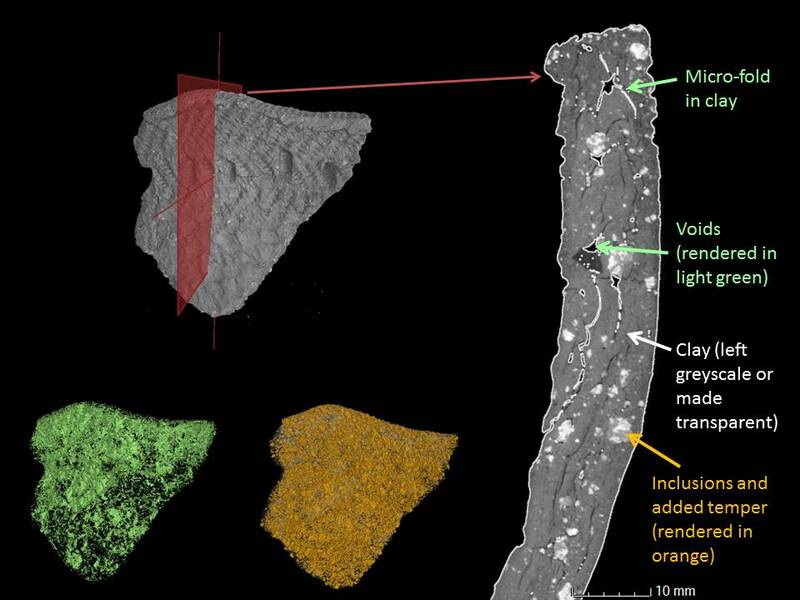 Micro CT uses X-rays to provide non-destructive, high resolution, fully 3D images of the interior and exterior of ceramics based on the density of materials. It can show us interior features in a unique way, augmenting traditional techniques that include destructive methods. As a case study, I’ve scanned ceramic shards from an archaeological collection that are part of a larger research project, directed by my supervisor Prof. Neal Ferris (Lawson Chair of Canadian Archaeology), related to a Late Woodland Borderland in southwestern Ontario dating to around 1100-1250 A.D. Micro CT is proving to be an extremely promising method for examining the interior features of ceramics. These include: voids/air pockets, micro folds in clay, and both intentionally added material known as temper and natural inclusions in clay, which you can see we can easily isolate in the 2D slices and 3D renderings that micro CT creates. Patterns that we can see in these interior features often relate directly to the formation techniques potters used to make ceramics. I’m finding that on these borderland sites, there were several different ways of making pots that are visible in the scans. For example, some pots’ rims are folded over, while others have clay added on to the exterior. So what I am demonstrating through the micro-analysis of ceramic craft is how micro CT can help us understand an often neglected aspect of this common artifact type: how people were using their hands and other tools to manipulate clay into pots. Using some of the most advanced technology available today, we can explore how the craft of making pots relates to communities, learning, tradition, and innovation over several generations in the past.